For most visitors, the easiest--if not always the fastest--way to get to Portage is from U.S. Route 22, exiting at Munster Road (Route 164), which leads directly to Portage Borough. Route 164 becomes Main Street as it passes through the borough. About midway through town, at Mountain Avenue, travelers should turn off Main Street (there's only one direction to turn) and head up the hill, where they'll find both the elementary and junior-senior highs at the top of the street. The junior-senior high (grades 7-12) is to the right, and the elementary school is on the left. The superintendent's and business offices occupy the righthand side of the elementary school. 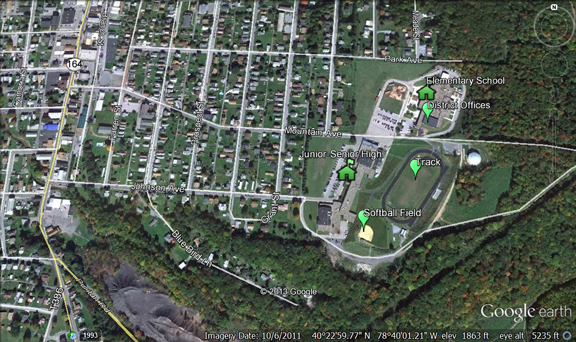 Johnstown -- 22 miles, 30 min. Altoona -- 29 miles, 35 min. Pittsburgh -- 85 miles, 1.75 hrs. Harrisburg -- 135 miles, 2.5 hrs. Philadelphia -- 240 miles, 4.25 hrs. Washington, D.C. -- 180 miles, 3.5 hrs.